Many studies have been done on the benefits of exercise to prevent cancer and also facilitate healing from cancer. Exercise for anyone is beneficial, but what kind is most helpful when going through cancer – and even after treatment is finished. Some of the best forms of exercise for achieving the goals listed below in a gentle way are yoga (look for yoga forms that are gentle – i.e. 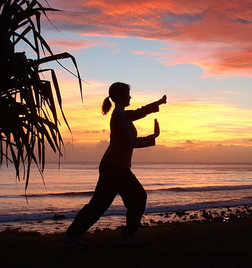 restorative yoga) and the ancient Chinese way of staying healthy, tai chi. Both of these forms of exercise to prevent cancer or heal from cancer can be done in a group or alone, inside or outside, without any equipment and special attire. These, together with walking, are easy, gentle yet incredibly effective and efficient ways to create an exercise program that will feed your body, mind, and spirit.